At least six Yemeni servicemen were killed and 14 more injured as a result of a drone attack on a military parade at the Al Anad military air base in Yemen’s governorate of Lahij carried out by the Houthi rebels, a source in the administration told. 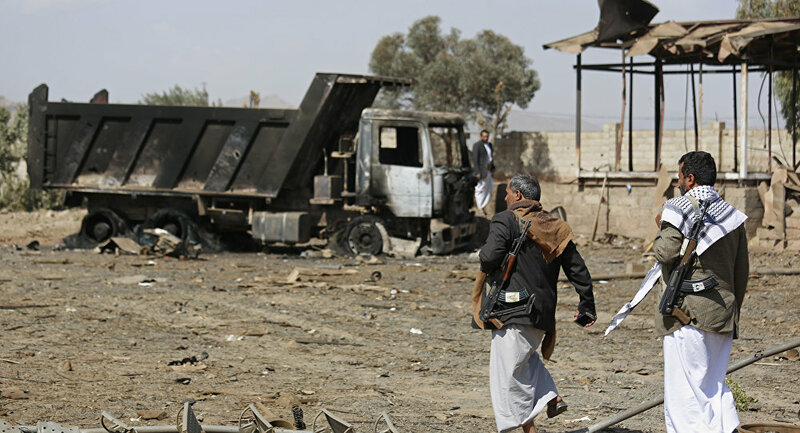 “According to preliminary data on the Houthis’ explosive-laden UAV attack, six soldiers were killed and 14 injured,” the source said Thursday. The source also added that Lahij Governor Ahmad Abdullah Turki and other military commanders were among those injured in the incident. The comments come after earlier on Thursday, Al Masira, a broadcaster run by the rebel Houthi movement, reported that the Houthis’ unmanned aerial vehicle (UAV) had conducted an attack targeting “invaders” and “mercenaries” at the Al Anad military air base. Following the reports, a source in the administration of Lahij Governorate told that Chief of Staff of Yemen Abdullah Nakhi, his deputy Saleh Zindani as well as the head of the military intelligence of the country, Mohamed Tamah, were injured in the attack. Yemen has long been engulfed in a state of war between the internationally backed government and the Houthi rebels. The Syrian wing of Al Qaida over the past few hours has reportedly gained control of a wider area in the region of Idlib in north-western Syria outside government control, which is under Turkish influence, according to sources on the ground and like reported by ansamed.info. The sources said that Al Qaida leaders in the region are forging bilateral agreements with other anti-regime militias previously coopted by the US and Turkey. 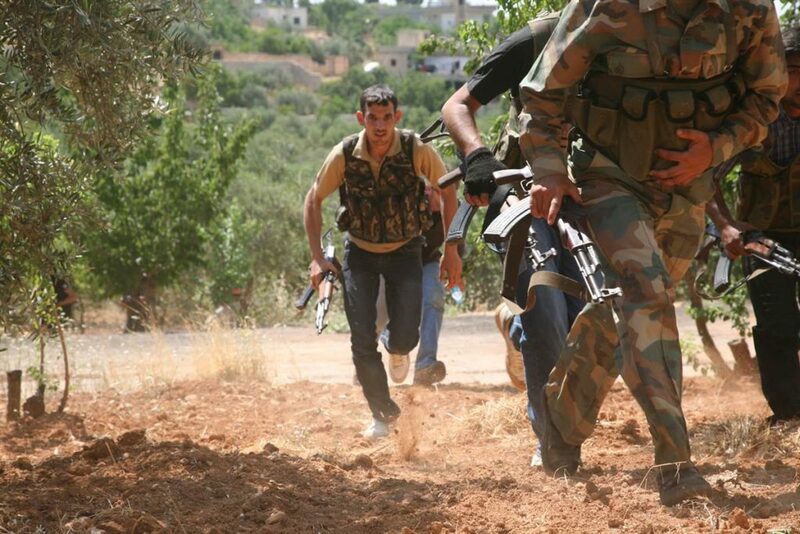 These accords have followed a series of military defeats over the past few days by Qaedists against pro-Turkish militias in the north-eastern and south-western part of the region of Idlib. The group of eight fighters included a German and a 16-year-old American. The US-backed Kurds are battling a last pocket of Islamist militants in eastern Syria, like reported by dw.com. Representatives from the Kurdish-led Syrian Democratic Forces (SDF), which is part of the Kurdish People’s Protection Units (YPG) battling “Islamic State” (IS) in Syria, announced Wednesday that they had captured eight foreign nationals fighting among IS’s ranks. Among those captured were a 31-year-old German , reportedly from Dortmund, and a 16-year-old American. Other fighters captured were Russian, Ukrainian, Kazakh, Tajik and Uzbek nationals. German prosecutors reportedly knew of the Geman, identified as Lukas G. in line with German privacy laws, as having been radicalized in Dortmund. Der Spiegel news magazine reported that security agencies lost track of him and that he traveled to Syria in 2014, according to information provided to the Federal Criminal Police (BKA). Prosecutors started an investigation into G. in October 2016, suspecting him of being a member of a foreign terrorist organization. Officials at the time had no indication G. had a high position within IS. The YPG, which is part of an American-backed coalition fighting IS, is currently seeking to defeat the last pockets of Islamist militants active near the Iraqi border in eastern Syria. Last week IS militants launched a series of counterattacks aimed at SDF. Some 23 SDF fighters were killed in those attacks and 30 more were injured. In all, at least 1,087 jihadis, 602 SDF fighters and 367 civilians have been killed since the SDF began its most recent offensive last September. On Sunday, the YPG said it had captured five fighters, including two Americans, one of whom was a former teacher from Texas. The SDF, which has been backed by coalition airstrikes, says it has captured roughly 1,000 foreign jihadis along the eastern banks of the Euphrates, as well as 550 foreign women and 1,200 children who were living with them. The fate of the Kurdish fighters was recently cast into doubt when US President Donald Trump announced the immediate withdrawal of US troops from Syria. The announcement came at the same time Turkish President Recep Tayyip Erdogan said Turkish forces would launch a military offensive against the Kurds, which Ankara considers terrorists due to their ties to the Kurdistan Workers’ Party (PKK). Iraq’s large and well-armed Shiite militias are now running many of the Sunni areas they helped liberate from the Islamic State, fostering local resentments that could fuel a resurgence of support for the extremist group, like reported by stripes.com. 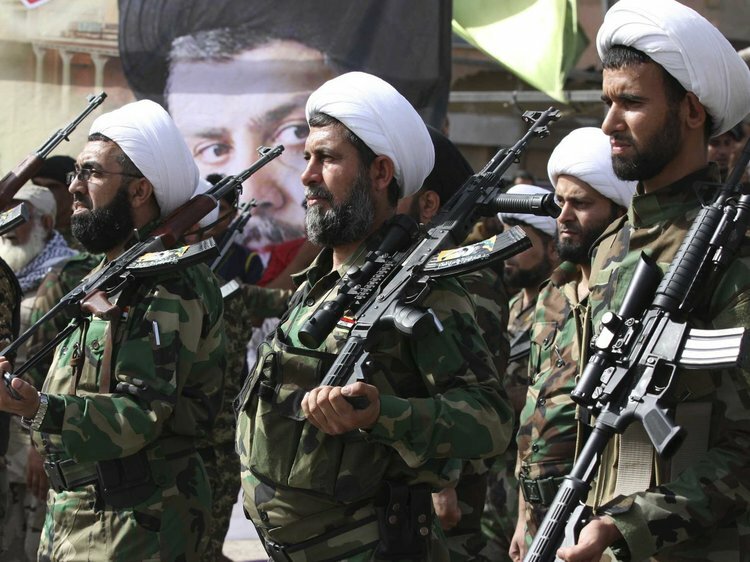 After winning nearly a third of the seats in parliamentary elections last year, the Shiite militias, including several ideologically aligned with Iran, are enjoying unprecedented military and political power in Iraq. Their ascension has raised concerns among Iraqi politicians, Sunni residents and U.S. officials that the militia leaders are creating a parallel state that undermines Iraq’s central government and revives the kind of Sunni grievances that underpinned the Islamic State’s dramatic rise three years ago. During the fight to oust the Sunni extremists of the Islamic State, Shiite militias mobilized to secure holy places and then grew into effective front-line fighters involved in nearly every important battle. They gained legal status in Iraq under the banner of the Popular Mobilization Forces (PMF), bringing 50 militias and approximately 150,000 fighters under nominal government control. Now, with major combat over, the militias – some with roots dating back to the Saddam Hussein era, others that emerged to fight U.S. occupation after 2003 and yet others that formed in 2014 to fight the Islamic State – are setting their sights on political and economic goals. They are fanned out across Iraq’s Sunni heartland, including the provinces of Anbar, Salahuddin and Nineveh, home to Iraq’s most-populous Sunni city of Mosul. In Sunni towns, the militias have established political and recruitment offices and operate checkpoints along major roads (and even smaller interior pathways), levying taxes on truckers moving oil, household goods and food. Some militiamen have engaged in “mafia-like practices,” several Iraqi and U.S. officials said, demanding protection money from both large and small businesses, while shaking down motorists at checkpoints to permit them to pass. The militias are also deciding which Sunni families are allowed to return to their homes following battles against the Islamic State, say analysts who study the groups. In several towns, militia leaders have compelled local councils to invalidate the property rights of Sunnis on the grounds that they supported the Islamic State. The practice has led to major demographic changes in traditionally mixed Sunni-Shiite areas such as Hilla and Diyala. With 1.8 million displaced Sunnis still living in camps and in overcrowded shelters, militia efforts to prevent them from returning home contribute to possible radicalization, said Hisham al-Hashimi, a security analyst who advises Iraq’s government and foreign aid agencies. The militias “are an obstacle to the stability of these areas because they are banning the return of internally displaced people,” he said. Iraqi politicians have proposed significantly reducing the ranks of the militias and either absorbing them into the regular police and army units or designating the PMF as an auxiliary force to be called on during national emergencies. Powerful militia leaders have resisted such suggestions, arguing that the success of these forces in evicting the Islamic State shows they are essential to Iraq’s national security. They also provide jobs for thousands of Shiites who would otherwise struggle in Iraq’s stagnant economy, their leaders say. Jihadists defending their last bastion in eastern Syria used the cover of bad weather to launch a deadly counterattack against a Kurdish-led force, a war monitor said Tuesday. The Islamic State group was unable to hold on to the positions they attacked but the assault killed 23 members of the US-backed Syrian Democratic Forces (SDF) and also left nine jihadists dead. IS fighters took advantage of poor visibility to unleash suicide attackers on SDF forces along the front line in the Euphrates valley late on Sunday, the Syrian Observatory for Human Rights said. 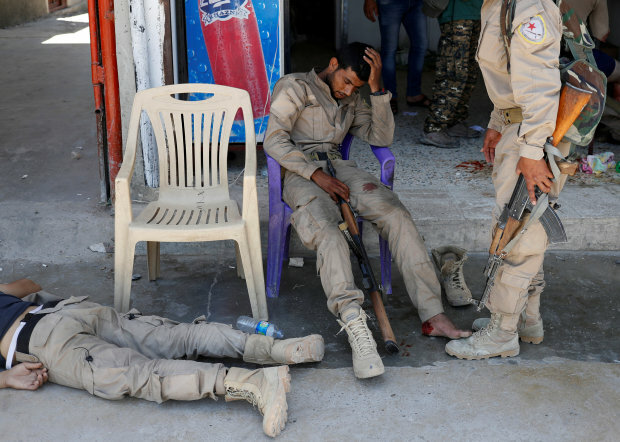 “Twenty-three SDF fighters were killed and nine IS jihadists were also killed in fighting that lasted all night and into Monday morning,” Observatory chief Rami Abdel Rahman said. The jihadists often launch attacks under the cover of bad weather that cancels out their opponents’ advantage of US-led coalition air power. The SDF launched what is meant to be the final offensive on the jihadist organisation four months ago with air and ground support from coalition forces. Two U.S. citizens who became ISIS jihadis in Syria — including a Texan who wanted to teach English in Mosul, Iraq — were captured by Kurdish-led forces, Stars and Stripes reported Sunday. Warren Christopher Clark, 34, was captured in a counterterrorism raid near the Iraqi border, the Syrian Democratic Forces said Sunday, the military news outlet reported. The ISIS fighters were preparing to attack civilians fleeing the area, the SDF said. Three other foreign fighters were caught as well: two men from Pakistan and one from Ireland, the news outlet reported. Officials with Operation Inherent Resolve, the U.S.-led coalition against ISIS militants in Iraq and Syria, were aware of the SDF release, but couldn’t confirm the account and were investigating, Stars and Stripes reported. Clark, who went by the alias Abu Muhammad al-Ameriki, was reportedly one of at least 64 Americans from 16 states who had traveled to Iraq and Syria since 2011 to join jihadi groups, mainly ISIS. He once submitted an application to join ISIS as an English teacher in Mosul, when it served as the capital of ISIS’s physical caliphate from 2014 to 2017, the news outlet reported. The second American the SDF captured was identified as Zaid Abed al-Hamed. The 35-year-old, who reportedly went by the alias Abu Zaid al-Ameriki. The US military has intensified its attacks on the Islamic State (IS) in the eastern parts of Syria while President Donald Trump has already announced the withdrawal of the US forces from the country, like reported by basnews.com. Earlier in December, Trump stated that he believes the war against the IS has ended and Washington’s mission in Syria was accomplished and therefore the US troops would pull out of the country. 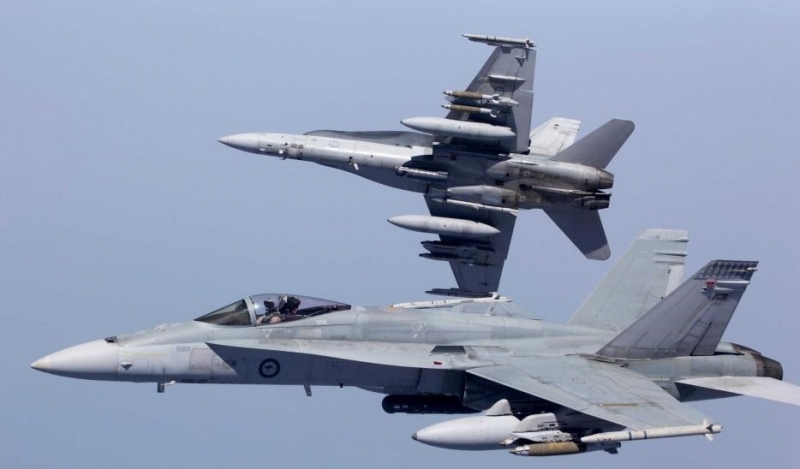 Al-Jazirah cited local sources as saying that the offensives by the US Air Force and artillery fire by the US-backed Syrian Democratic Forces (SDF) were carried out last week in the village of al-Kashmah on the Euphrates River near the border with Iraq. The report added that the residents and family members of the militant group had fled the village to the south, adding that al-Kashmah has not been controlled yet. However, the village has become a front line for the fight against the insurgents in the province of Deir ez-Zor. Two landmines laid by the Houthi militias at public roads killed five Yemeni children in Hodeidah and Lahij on Tuesday and Wednesday, local and medical sources reported according to aawsat.com. The sources told Asharq Al-Awsat newspaper that three sisters under the age of ten died in one of the blasts. Their father works for the Houthi group in return for food aid and a maximum salary of YER30,000 (around SAR500), the sources added. The incident occurred only one day after two children were killed in al-Durayhimi district, south of the port city of Hodeidah, after a bomb, planted by the pro-Iran group to obstruct the advance of government forces, went off. Medical sources revealed that the two boys were brothers under the age of 10 and were on their way to get water for their family. Days earlier, another landmine killed four farmers and wounded four others in Mocha, despite relentless efforts by the Yemeni Army and the Arab Coalition to clear thousands of landmines during the past year in western coastal areas. Landmines scattered by the Houthi rebels are largely unmapped and will remain a threat in Yemen. More than 3,000 people – most of them children and women – have been killed and injured by Houthi landmines, according to rights reports. In the first half of 2018 alone, landmines killed around 120 civilians. 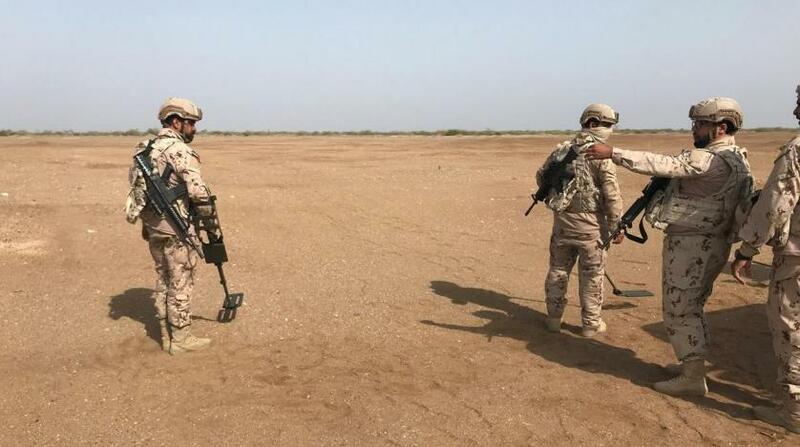 In mid-2018, Saudi Arabia launched the USD40 million MASAM project for landmine clearance in Yemen. The project is funded by the King Salman Humanitarian Aid and Relief Center (KSRelief). Fighting in rebel-held parts of northern Syria has killed dozens of people as al-Qaida-linked militants press their offensive against Turkey-backed rebels. The Britain-based Syrian Observatory for Human Rights said Wednesday that two days of fighting in the provinces of Aleppo and Idlib have killed 31 people, mostly fighters. The al-Qaida-linked Levant Liberation Committee and the Turkey-backed Nour el-Din el-Zinki group blamed each other for triggering the fighting, the worst in nearly three months. 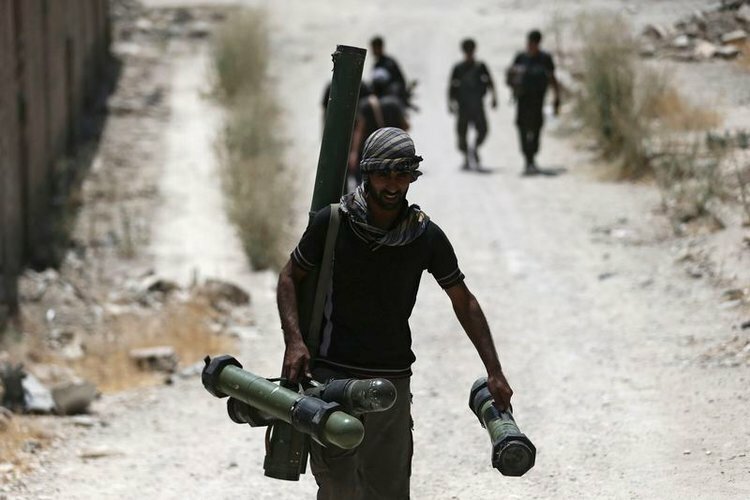 The government-controlled Syrian Central Military Media says al-Qaida-linked fighters are now in full control of the strategic town of Daret Azzeh and have also captured the villages of Kafrantin, Fadra, Houta and Mkalbis. While the United States is planning to “withdraw all of its troops from Syria,” Israel’s Prime Minister Benyamin Netanyahu has said that Tel Aviv is on the verge of a great victory in Syria in the campaign against Iran’s influence, like reported by radiofarda.com. The United States said on Wednesday it has begun withdrawing U.S. forces from Syria while President Donald Trump tweeted that Islamic State group has been defeated. This is total withdrawal of all 2,000 troops. Senior U.S. politicians, including Republicans and some allies were surprised by the decision and expressed doubt about the official reason for the decision that IS is defeated. CNN reported on December 20 that the withdrawal can be a deal Trump has made with Turkish president Recep Erdogan. But at this point it is too soon to make a definitive judgement. 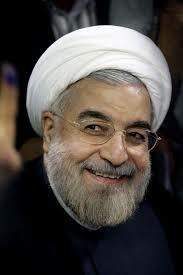 Would such a deal also involve the withdrawal of Iranian forces from Syria? Meanwhile, Netanyahu said at the Globes Business Conference in Jerusalem that Israel is the only country in the world whose army is “directly at war with Iran.” He added that while the U.S. is targeting Iran’s economy, “Israel strikes Iran in Syria.” He vowed that Israel will force Iran out of Syria. However, Netanyahu added that Israel is committed to the campaign against the West’s nuclear deal with Iran, also called the Joint Comprehensive Plan of Action (JCPOA), and expressed his satisfaction over the re-instating of US sanctions against Tehran. Netanyahu criticized the Obama administration for the nuclear deal which he said “allowed Iran to resume unlimited enrichment in ten years, and gave it billions of dollars to build its empire,” alluding to Tehran’s regional ambitions in Iraq, Syria and Yemen. He said he has talked with US President Donald Trump and Secretary of State Mike Pompeo over the phone, but did not elaborate on the subject of his conversations. Meanwhile Atlantic Council assistant director David Wemer wrote in an article on the Atlantaic Council website that “On December 17 here at the Atlantic Council, US special representative for Syria James Jeffrey called again for the ouster of Iranian forces, thus suggesting that they have not yet left. But not forty-eight hours later we learn that US forces are indeed preparing for a “full” and “rapid” withdrawal from Syria, while reminding that national security adviser John Bolton had said in September that “We’re not going to leave as long as Iranian troops are outside Iranian borders, and that includes Iranian proxies and militias,”, committing that US forces would stay in Syria as long as Iranian forces were in the country. Netanyahu may have attempted to use his prior information about the US troops’ withdrawal from Syria to claim an early victory. His recent remarks about “Israeli agents regular visits to Iran” and his threat that “Israel might directly attack Iran” may have disclosed part of Tel Aviv’s hitherto secret war against Iran.